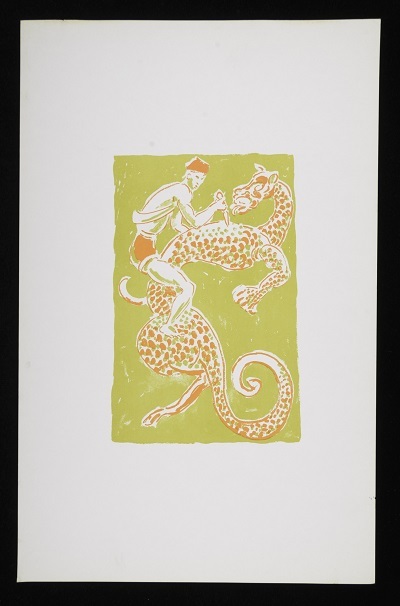 Now we have moved onto cataloguing larger works we are uncovering many intriguing and beautiful works but what especially caught our eye this week was a collection of original lithographs and colour proofs by Duncan Grant. Up in the Charleston Attic we are used to playing detective and after some research we learnt that this collection of forty pieces are a result of a commission in 1965 by The Folio Society to produce illustrations for its publication of Arthur Waley’s translation of Monkey: a folk-tale of China, more commonly known simply as Monkey. The translation is an abridged version of the 16th century Chinese novel Journey to the West by We Cheng of the Ming dynasty. Monkey is widely considered to be one of the four great classical novels in Chinese literature and is based on the true story of a pilgrim named Hsuan Tsang. In the seventh century Hsuan Tsang travelled to India to procure the true Buddhist Holy Books to translate into Chinese, making a great contribution to the development of Buddhism in China. By the tenth century the pilgrimage of Hsuan Tsang had become the subject of fantasy and folk-lore and from the thirteenth century till the present day the story has been constantly presented and re-imagined on the Chinese stage. The novel takes the tale of Hsuan Tsang and presents it as a combination of folk-lore, allegory, religion, history, anti-bureaucratic satire and pure poetry. At the outset of the novel Buddha seeks a pilgrim who will travel West to India with the hope of retrieving sacred scriptures by which the Chinese people may be enlightened. A young monk called Tripitaka volunteers to undertake the pilgrimage and on his journey he encounters the Monkey King and two monsters in human form named Sandy and Pigsy. The theme of the novel is mans journeying through the difficulties of life with Monkey representing the instability of genius, Pigsy symbolising physical appetite and brute strength while Sandy embodies sincerity. 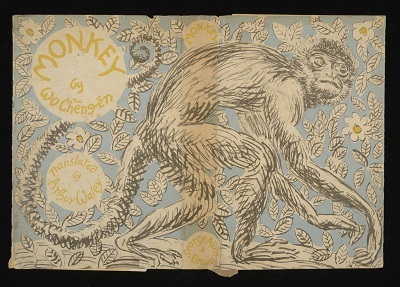 Hatched from a stone egg and given all the secrets of heaven and earth Monkey can transform himself into seventy-two image such as a tree, a beast of prey or an insect and can ride on clouds, travelling 108,000 miles in a single somersault. 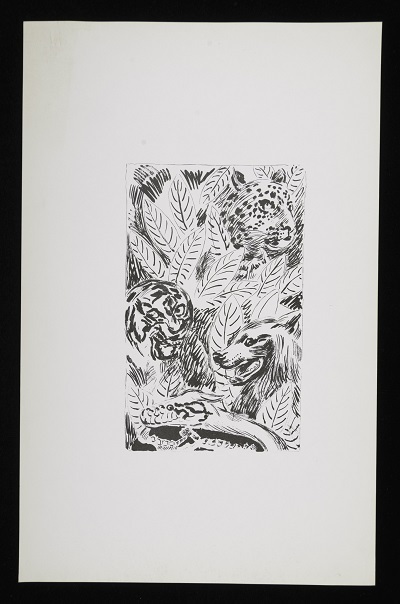 Grant produced twelve lithographs for the 1965 publication, with examples of eight of these works in various stages of completion being found in the Angelica Garnett Gift so far. Previously he had been commissioned to design the jacket for the 1942 edition of Monkey. In the cover design he wound the image of the Monkey King around the entire book and at the suggestion of the publisher David Unwin the title details of the book were put at the back, so as to be in keeping with the reverse nature of Chinese literature. The pieces found in the Gift show the various stages of colour proofing Grant would have completed before he was happy with the final image. 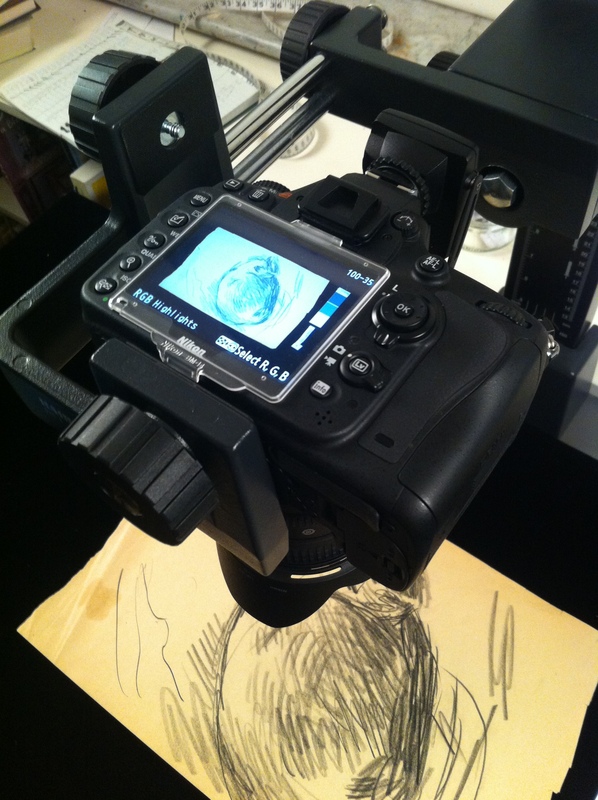 We see the same image being produced repeatedly with different colours added or taken away. It appears that Grant worked to apply a deliberately Chinese style for some of these works. 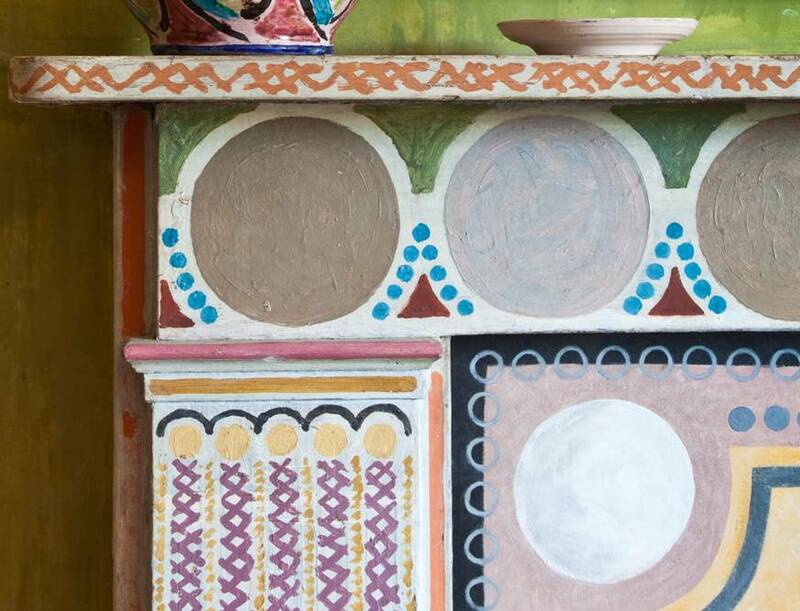 We know that there were established links between China and the Bloomsbury group. Julian Bell, Vanessa’s son, lived and worked in China, sending Chinese silks, porcelains and ceramics to his mother at Charleston and Roger Fry delivered Slade Lectures on Chinese Art at Cambridge. Some of these ceramics and other objects of Chinese origin remain on display at Charleston today, for example the cast of a sixth century AD Chinese Bihisattva Kuan-Yin, Goddess of Mercy which was given to Grant and Bell by Fry is in the artists former studio. 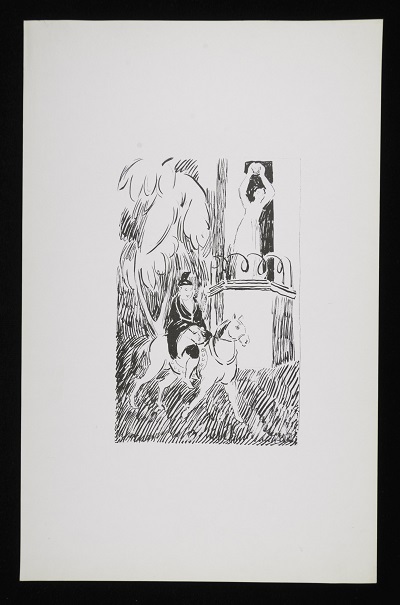 Grant’s and also Vanessa Bell’s enthusiasm for lithography was encouraged by French artist, and friend to the Bloomsbury artists, Pierre Clairin. Professor of Lithography at the Ecole des Beaux-Arts, Clairin was often Grant and Bell’s host in Paris and had much experience of the procedure of lithography. Examples of his small and delicate colour lithographs can be seen on the walls of Charleston to this day. 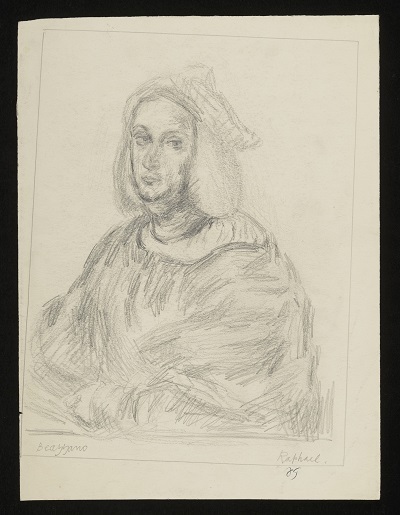 Having gained knowledge of lithography in Paris it was closer to home where Grant would find a patron, or patrons, to allow him to develop his interest in producing prints and lithograph illustrations. The Ladies of Miller’s, sisters Frances Byng-Stamper and Caroline Lucas, opened a gallery on the High Street in Lewes in 1941. With a passion for art, literature and music and the support of Maynard Keynes, the chairman for the Council for the Encouragement of Music and the Arts (CEMA), the sisters secured the pick of touring exhibitions and presented shows with sculpture by Rodin, Maillol and Epstein and paintings by Bonnard, Picasso and Derain. Clive Bell was heard to joke that ‘Lewes had become one of the cultural capitals of Europe’ as the sisters began publishing books, instigating lectures, concerts, began a shortly lived art school at which Grant and Bell were teachers and organised a retrospective of the Omega Workshops. At the end of the war in 1945 the sisters were to receive an exhibition by CEMA of European lithography from 1792 to the present day. 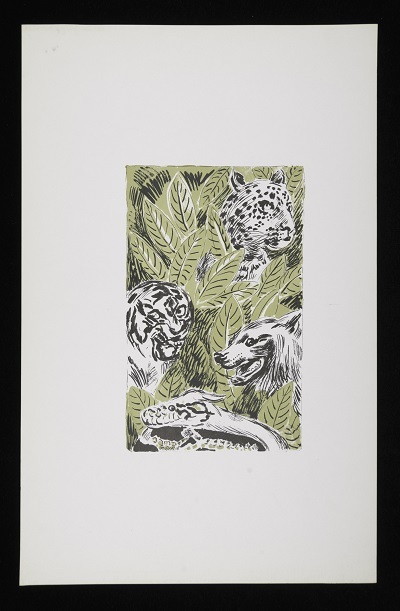 To this they added their first publication of a portfolio which contained two lithographs each by one of the Ladies of Miller’s herself, Caroline Lucas, Vanessa Bell, South-African born painter Ensin du Plessis and Duncan Grant. This first publication was an resounding success with the public responding avidly and the one hundred copies of Eight Lithographs which was priced at five pounds being sold within weeks. This positive public reaction led to the Ladies of Miller’s joining forces with the Redfern Gallery in London in 1948 to form the Society of London Painter-Printers. The gallery at that time was under the direction of Rex Nan Kivell and was considered to be the principal outlet for contemporary prints. That year, Six Lithographs by Grant and Bell was published. The lithographs they produced for this work had an undeniable charm, their anecdotal subject matter appealing to the masses with portraits of their grandchildren, still lives of flowers and fruit and images of domestic animals. The working relationship between Grant, Bell and the Ladies of Miller’s continued until the Press was disbanded in 1954. 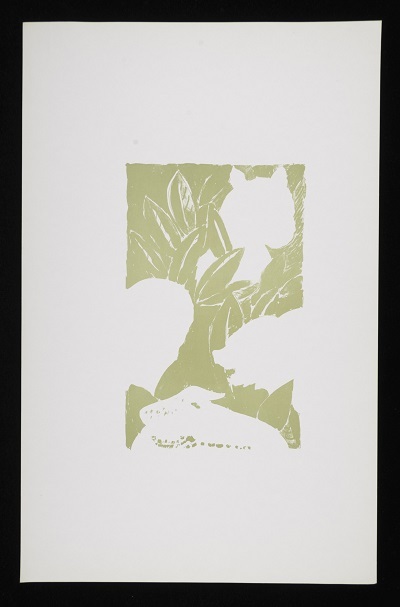 Although Grant accepted occasional invitations to produce lithographs and etchings following Bell’s death in 1961 the most productive years of their collaboration concluded with the dissolving of the Press. Much has been written about the art and private lives of the Bloomsbury artists yet little attention has of yet been paid to their graphic work. Although it forms only a fraction of their artistic oeuvre, Grant’s Monkey illustrations demonstrate clearly his ability to produce light-hearted, delicate and engaging lithographs. 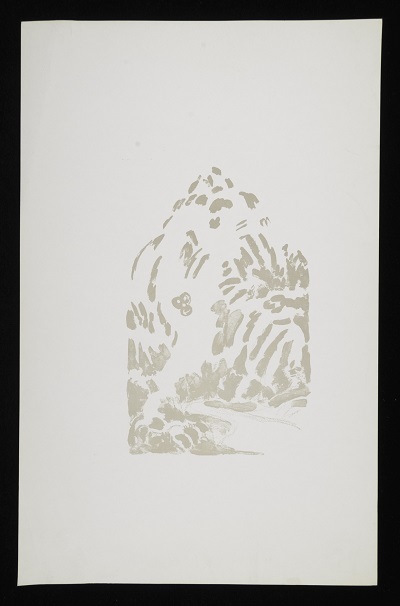 Grant, echoing Roger Fry’s desire to dismantle the barriers between high and applied art, would accept any printing commission that was offered to him, although of course payment for artwork would surely have also been a motivating factor to print. Arthur Waley’s translation of Monkey remains one of the most read English language versions of the novel and one can imagine that Grant’s illustrations have provided delight and entertainment to many throughout the years and hopefully will continue to in years to come. 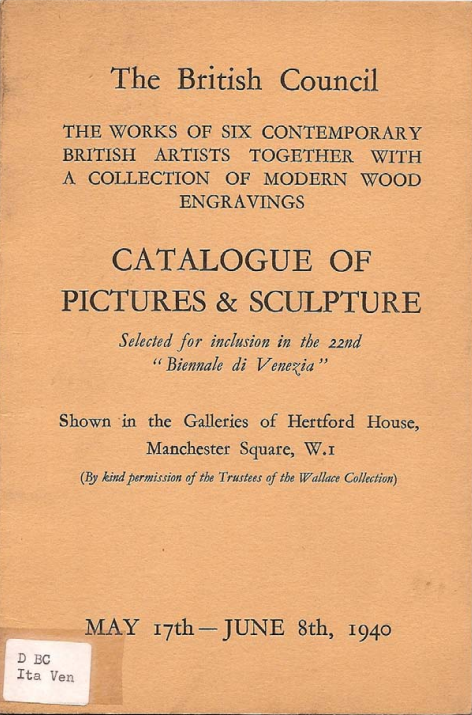 In 1939 Duncan Grant was invited with five other artists – Frank Dobson, Glyn Philpot, Frances Hodgkins, Alfred Munnings and Edward Wadsworth – to represent Britain at the 1940 Venice Biennale, the invite for which we have recently unearthed in the Angelica Garnett Gift. 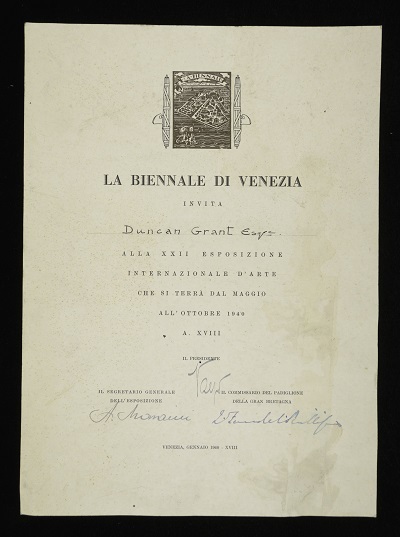 First held on April 30th, 1895 to celebrate the silver anniversary of King Umberto I and Margherita of Savoy, the Venice Biennale remains to this day one of the leading exhibitions of contemporary art in the world. In addition to Bloomsbury group member Clive Bell, the Selection Committee for Britain’s 1940 entry consisted of Sir Lionel Faudel-Phillips, Campbell Dogson, Lawrence Haward, Sir Eric Maclagan, Herbert Read, the Earl of Sandwich, and Alfred Longden. Four months after this invitation was received, however, the British Council withdrew from the show. Two days after Nazi invasion of Poland on the 1st September 1939, Britain and France declared war on Germany, commencing a long and bloody conflict that would last until the 14th August, 1945. Although the British Council’s official reason for withdrawal was that it could not risk sending some £30000 worth of art abroad in wartime circumstances (grounds also used by the French to defend their own withdrawal from the Biennale), growing anxiety regarding Italy’s fascist politics can be seen as the real motivation behind this decision, and later confirmed with the country declaring war on both Britain and France on the 10th June, 1940. These [works] should have left the country two or three weeks ago, and should today (May 17th) be hanging in that fine British pavilion in the public gardens of Venice. Dis aliter visum: the agitated state of our unhappy continent made the sending impossible. Wherefore, what we had hoped to show our Italian friends is here presented to the British Public. Thus, every other year, is displayed a sample of what each country is producing and what its public admires; and thus, though it is improbable that anyone will like all that he is shown, he must be hard to please who likes nothing. Should one result of such an exhibition be a small increase in the spirit of toleration, the exhibition will not have been held in vain. One cannot help but speculate whether this reference to ‘the spirit of toleration’ refers solely to modern art and its viewing public, or whether it hints also to the wider social and political concerns of war-torn Europe at this time of unrest. We arrived at Hertford House and found all his paintings already hung and Clive and an underling on the spot. My first feeling was one of horror. The paintings were so badly hung that one could see nothing. The question was how to undo practically everything, with tact. But if the show was to do any sort of justice to Duncan it had to be done somehow, so we began making small changes. Luckily Clive hadn’t really any feelings and realised we had more experience in such matters and the underling who was at first horrified became reconciled and in the end we changed it all and it looked lovely. I think of writing a book upon hanging, with illustrations. Very few people know anything about it and yet there are quite a lot of rules one can follow. I wish Roger had done it. 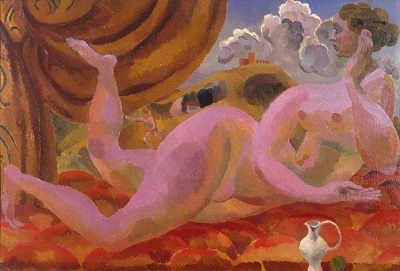 Duncan Grant’s The Tub, painted around 1913, was one of the works exhibited in the Hertford House show. Photograph © Tate, London, 2015, sourced here. Whether due to Vanessa’s intervention or not, Grant’s works were well received by the press, and he was also said to ‘dominate’ the ‘Nine Painters at the Lefevre’ exhibition and had a solo show of forty-one drawings and sketches at the Calman Gallery in 42 St James’s Place. Celebrating the artist’s recent successes, one critic called it ‘Grant’s Week’, prompting Vanessa to protest dryly, ‘I think you’re really getting too famous.’ Despite his celebrity status, Grant learnt about much of his success second hand, as, at the request of the War Artist’s Advisory Committee, he had left Charleston to paint the sailors at Plymouth. You can read more about Grant’s Plymouth commission here. 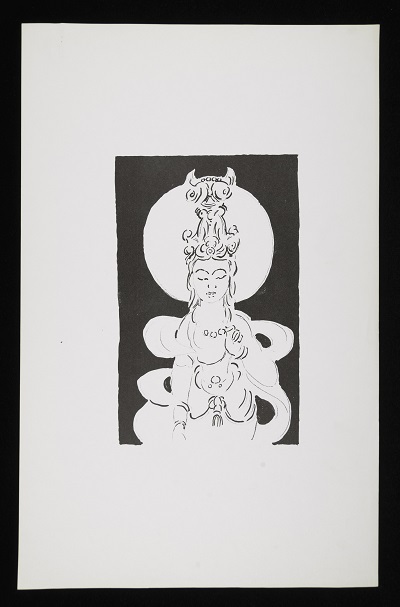 Like the invitation to the 1922 Redfern Gallery Summer Salon, discussed in another blog post here, this object in the Angelica Garnett Gift documents a fascinating moment in both Grant’s artistic career and the wider art world during a time of political and social unease in Europe. This post celebrates the end of processing the large box of loose works on paper that we started in January, the last picture in the box being a sketch of a sleeping cat (shown above). We hope that you’ve enjoyed reading about our finds. We are now cataloguing larger works, including numerous paintings and colour studies, so stay tuned for more updates from the Charleston Attic…. When working through boxes in the Angelica Garnett Gift, we often encounter items which document significant commissions in Bell and Grant’s careers beyond the walls of Charleston. 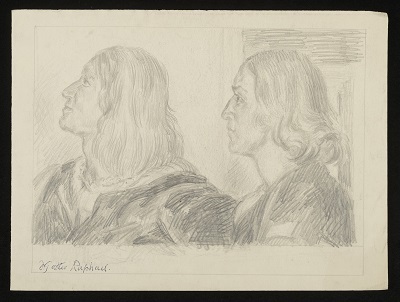 Such items can also lead to a consideration of other practitioners with whom the pair collaborated, including leading figures in the worlds of art, design, dance, literature and theatre. Previous posts have highlighted such projects, including discussions of Grant’s ballet designs and Bell and Grant’s textiles. 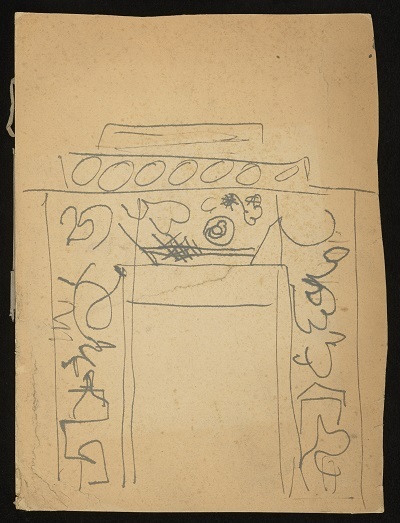 A recently unearthed example is the small sketch below which documents Grant’s collaboration with the British painter, illustrator and designer, Robert Medley. Very little has been written about Grant and Medley’s commission, therefore it seems fitting to investigate the project and report our finds on The Charleston Attic blog, inspired by this small ink drawing. Robert Medley had made acquaintance with Grant around 1925 when helping with the production of Lytton Strachey’s play, ‘The Son of Heaven’. After then being hired by Grant to paint the entire interior staircase of 52 Gordon Square – ‘bloody high houses as you know… It really was a ghastly business, it’s very funny actually’ recalled Medley – he began assisting both Bell and Grant on a number of projects into the 1930s. One of these was the Cozy Stove; a commercial household range that was to be launched at an industrial arts fair, hosted at the Victoria and Albert Museum around 1929. It is a design for the Cozy Stove that we recently uncovered up in the Attic Studio at Charleston. There was a standard Cozy Stove…just a metal thing about this high; would I design this thing. And it had to be done according to certain principles which were enunciated by Mr Fiedler. First of all… you can’t clamp the tiles on to the Cozy Stove itself, it had to be a separate case…and then of course it couldn’t be…a great big solid affair, because it had to be a commercial thing, so the idea was [that] each tile was to be made with a loop at the back, two loops, to be threaded on metal rods do you see, and then workmen could then easily assemble that with a bit of cement in everybody’s house without any difficulty. So, anyway my job was simply to design the look of the exterior of the stove. Well knowing Duncan’s work very well by then, I gave him this kind of shape…to decorate in the kind that he would like. The finished tile designs are highly reminiscent of Grant and Bell’s decorations at Charleston, with their circular motifs, scalloped borders, stippled colours, and bold fruit and figurative motifs. Despite its commercial failings, one can argue that visually the Cozy Stove successfully united Grant’s ‘haphazard’ Bloomsbury style with a commercially-produced utility object, a unison similarly achieved with his fabric designs for Allan Walton Ltd. and ceramics for Foley. 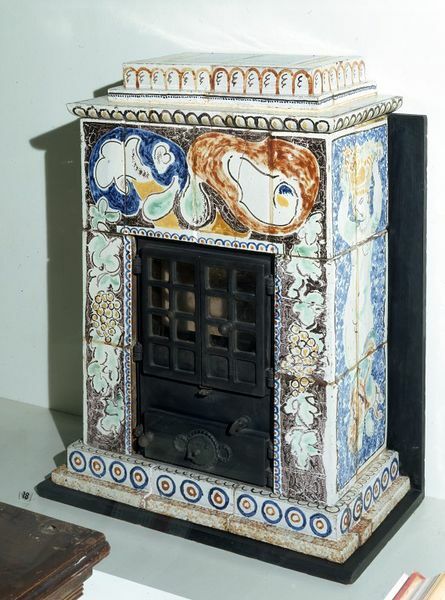 Although Grant and Medley’s offering did not go into production as intended, the Cozy Stove did go on display at the V&A, where it can still be seen today in the 20th Century Gallery. 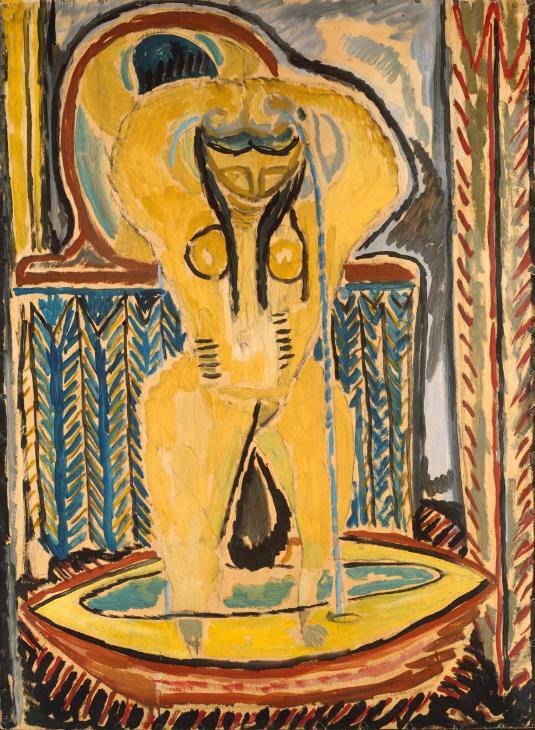 During museum week the Charleston Attic discussed the influence that Old Master paintings had upon Duncan Grant and Vanessa Bell, extending their knowledge of art history and providing inspiration for their own creative endeavours. Over the past few weeks the Angelica Garnett Gift has offered us further examples of this, with three exquisite studies after Raphael by Grant. We know that Grant was an artist who explored many different means of expression from his work with the theatre to decorative schemes yet his portraits of friends and family are perhaps the most revealing. These studies of Raphael’s portraits demonstrates Grant’s sensitive handling of a subject which he employed in his own works. 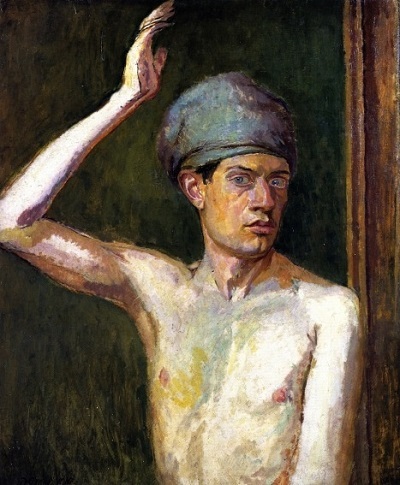 They also show us Grant’s appreciation and understanding of the importance of light, shadow and space, his Study for Composition (Self-Portrait in a Turban) of 1910 and 1916 Portrait of Vanessa Bell being excellent examples of his use of negative space. This letter, which is quoted in Simon Watney’s book ‘The Art of Duncan Grant,’ is thought to be the most detailed surviving account of, and response to a single work of art by the artist. The influence of Old Master paintings can be seen to play an important role in Grant’s approach to his art throughout his career. 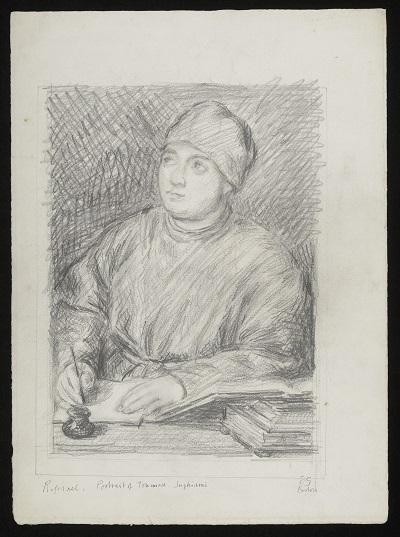 In addition to his careful consideration of forms and handling of colour and light, various motifs from works such as Raphael’s repeatedly appear in paintings, sketches and prints. The hanged curtains that we see adorning the upper corners of the Sistine Madonna are a frequent feature in Grant’s work, for example the painting Venus and Adonis which is now part of the Tate’s collections and a painted panel for the Lefevre Gallery, at Brighton and Hove Museums and Art Galleries.